Lumpia Shanghai is one of my favorite finger goodies. I like to make the shanghai type all because it’s very easy to prepare. You will probably find all kind of recipes online but I have my own recipe, the one that is not too complicated to understand. A recipe that I grew up with…easy and simply yummy with plain soy sauce or sweet and sour sauce. 1. In a large bowl, combine ground beef, onion, carrot, celery, garlic, egg, soy sauce, salt, and pepper thoroughly. 2. Lay out a lumpia wrapper one at a time in a flat surface, and place a tablespoon of the filling in a line down of the wrapper. 3. Take the bottom and top edges of the wrapper and fold then towards the center. 4. Take the left and right sides, and fold them towards the center. 5. Moisten the last edges of the wrapper with water to seal. 6. Repeat procedure using the rest of the wrappers. 7. In a deep pan or fryer, heat oil to 375 degrees F.
8. 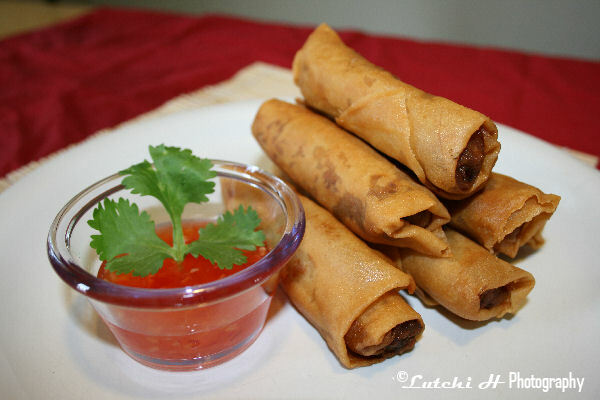 Fry lumpia’s (5 to 6 pieces at a time). 9. Fry until golden brown (3-4 minutes), turning once. 10. Drain and Enjoy with your favorite sauce. 2 Comments On "Lumpia Shanghai"
Oh that looks like one to die for. You always have such good recipes.